Candles are a highly detailed story about what prices had done recently and what it is doing right now. The picture on the left is a reversal pattern? No, this is just some indecision at the end of a trend. It might be a transitionary period, or it might be a short range or resting period from which price will just continue in its original direction. On the other hands, this is just a strong candle showing us that buyers have control of price. Is price about to reverse here? No those are not reversal patterns. It’s just indecision and prices trapped in a range. 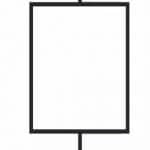 Reading the price that creates the candle is much more important than knowing a list of generic candle panels. Again, candles give us information on what price is doing right now. With that information, we can make an educated guess as to what price is going to do next. And that is what Forex trading is all about: making intelligent, data-driven and educated guesses as to what price will do next. 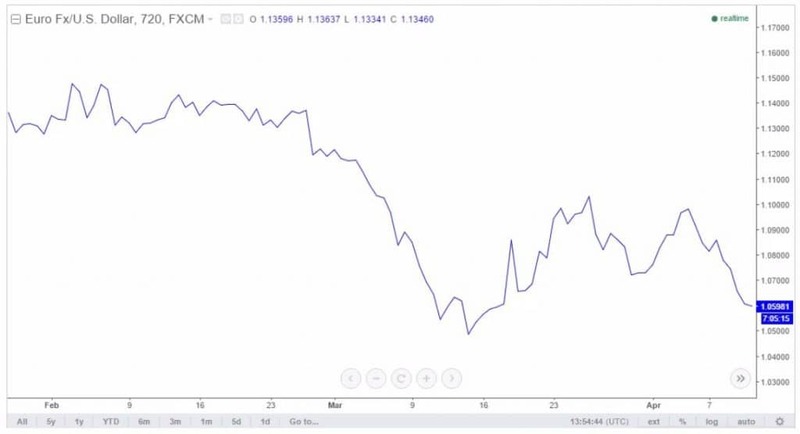 The picture above shows a line chart of Euro USD. 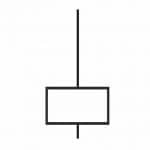 This chart shows us price action in its simplest form. It’s just a line pointing up when buyers are in control and point them down when sellers are in control. Can we gather extra information? This is a candle chart overlaid on a line chart of the same period. You can see that the candle chart gives us some more in-depth information about what price is doing and what it has done recently. Each of these candles is a snapshot of exactly what price was doing when that candle was open. It tells us a lot of precious information. 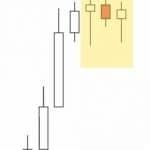 But each candle you see can be broken up into smaller candles all the way down to tick charts and this is vital. It may sound undeniable and very straightforward, but few people think about this on trading. But the more we learn about price action, the more this simple concept will start to make sense and the more useful it will be to you. A ranging period on a four-hour chart may be indecision on the daily chart and a trend on a one-hour chart may be a small blip on the daily chart. Again, I know this is obvious. However, think about what this means; switching between time frames is extremely beneficial when you’re trying to read price action. It is beneficial when you want to understand the story of a candle. 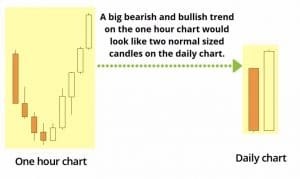 If you’re looking at a daily candle and you’re trying to understand what it is telling you about that candle but you just cannot make sense of it, it would be beneficial to switch over to the 12-hour time frame. 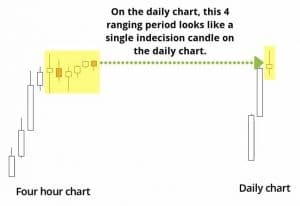 The smaller time frame will split that daily candle into two separate candles, dividing the daily candle into two, which will help you understand what price was doing during that day candle’s life. You can even drop down to an eight-hour chart and split that daily candle up into three separate candles because three eight hour candles make up a daily candle. The point is, when reading price action switching time frames helps, and you will find yourself changing time frames a lot when you start trading price action. We may see some price action on the four-hour chart, and we realize that this is just too much information there. We then might want to smooth out the price action, so we go up to the 12-hour chart. What is this candle’s story? Well, after a strong bearish trend we see indecision forming. The lower wick indicates that settlers tried to push down but lost power and the upper wick suggests that buyers were not able to drive price up either. The body of the candle closing only a few pips away from the open indicate that neither sellers nor buyers could gain control of price. This candle shows indecision. We see a struggle between buyers and sellers, but neither side can get the upper hand.